Protect your hands and forearms while pruning! 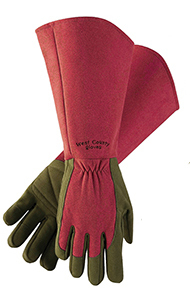 Safety Works West County Rose Gauntlet Gloves provide the ultimate thorn and bramble protection. They offer full forearm protection with elegant style and are ideal for rose pruning, clearing brush, working with lumber, and handling abrasive material.